At this point I realize that , so far , I did not say how many we are. We are currently a dozen monks , our ages range from 46 to 95 years . At home we are ten . Some often are out to take courses of theological education , one is taking care of a parish in Genoa ( entrusted to the Benedictines for over a century ) . Some have serious health problems , illness or age ( ipsa aetas infirmitas ) . There is a presence on the ground that it is a valid testimony , also effective from the pastoral point of view , even if today we don't talk about it any more . We, however , as the Benedictines , we hold dear such a presence that , according to ancient tradition , has made Europe more Christian. According to historian P. Gregorio Penco OSB , one can speak of a monastic presence in piae castrum already in the twelfth century , although the history of the sons of St. Benedict in Finalpia begins with the Olivetan Congregation in 1476 . In front of our Abbey there is a bridge that crosses the Sciusa , since the Middle Ages .That bridge has been crossed by popes and emperors , armies of the Marquis Del Carretto , Spain and Napoleon . Even the Benedictines have gone through - as everyone in Finale Ligurel - for centuries . And then - in 2012 - our City Council - asked us to dedicate at Saint Benedict. Since the fifteenth century , the Benedictines are dedicated to the pastoral care of the parish of Finalpia . So our Community also provides pastoral care to our two chapels ( St. Anthony al Monte and St. James Manie ) , which are located in the parish territory . One monk is parish priest in Vezzi , the hinterland of Finale , and provides religious services to some diocesan parishes . Also another monk is also parish priest of St. Martin of Genoa - Pegli . It is difficult to calculate the number , vary widely depending on the seasons . You can , with approximation say that not less than 1500 and that in summer can exceed 2,000 . It is hard to calculate the number of occasional tourists . In high times of the year , as Advent and Lent , we take care of - directly or through collaborators and occasional guests - meetings of Religious Education : Lectio Divina , conferences and music evenings . During the summer holidays , the training initiatives - whether religious or cultural - see a significant participation of holidaymakers . To enter the conference room click on the following Panoramic photo : " The audience of a conference in the hall of the first cloister ." In the summer the organ of our church shows his good qualities , under the hands of skilled organists : solo or in accompaniment of the human voice . Other musical evenings were offered with virtuoso performances ( solo vocals , choirs, guitar , harpsichord , flute ... ) . If you click on the photo below you you will be introduced in our church , where there were some beautiful evenings . The cataloging of our considerable amount of books is under way, more than 60,000 volumes - not counting the various collections of journals and periodicals . Thanks to the valuable contributions of the Foundation De Mari Savona so far more than 8,000 volumes have been cataloged, both by our monks , and by Biblio , a specialized firm in Turin. The contributions of De Mari are currently suspended : we hope they start again as soon as possible . The catalog of books , followed by a logical location , makes accessible and living a library otherwise likely to remain only a powdery deposit . Click on the photos below and you can see some pictures from our library : it was up to 2004 and it is now. You 'll find some photos of Incunabula and books of 1500 ( the famous Cinquecentine ) . According to the ancient tradition of the monasteries also in Finalpia we have an Apiary . We produce various types of honey ( ACACIA, ORANGE , CHESTNUT , EUCALYPTUS , SUNFLOWER , LAVENDER , RODODENDRO , SULLA, TARASSACO ... ) . The variety of honey dipend on the catchment area of our Apiary ( ie the areas , where we put our hives ) is not limited to Finalpia . We are , in fact , usually sort of our hives in the provinces of Cuneo , Asti , Alessandria , Piacenza and some areas of western Liguria . The Benedectine Apiary of Finalpia does not limit to the production of honey , but covers a wide range of products derived from the activities of bees : pollen , propolis , royal jelly and various creams ( aesthetic and healing ) . Obviously for such a wide activities we have non monastic staff. Click on the photo below to enter the world of bees and their precious gifts . The complex of the apiary with " La Baita " . Our long experience , in the assiduous care of bees , suggested to communicate to others what has been learned . 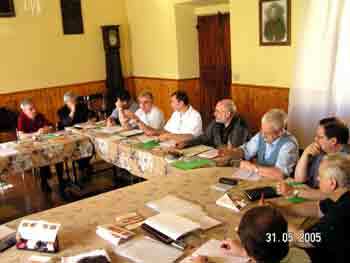 In the large room of the former printing shop of the monastery - appropriately reconditioned - our Apiary organizes regular courses of Beekeeping , very popular . The good relationships cultivated with Regional Institutions and Universities allows us to maintain vibrant and profitable contacts with those working in the world of bees . Many visitors to an Abbey expect to find in a Monastery of fine liquors . among its products - as well as bitters and digestives - the renowned and patented Grappa honey . The last product born the Beer Honey : an intriguing and fresh mix of sweet and bitter . In the first half of the last century (1914) the monks of Finalpia founded the first Italian Liturgical Magazine, still in publication. At the beginning they coordinate in house articles (written by monks and qualified collaborators) and it was printed outside from the Monastery. Then (obviously to reduce expenses) compiled in the house, only printing to a printer outside. It came, finally, to do everything in the house: drawing, composition, printing and mailing to subscribers. It was a big job that engage heavily our Community. This initiative is an ancient activity, for us Benedictines. It is true that Gutenberg had started the printing of the Bible between 1453 and 1455, but hardly anyone knows the first Italian printing press was installed just in a Benedictine cloister in 1463: that of the Monastery of St. Scholastica in Subiaco. This was the work of two German printers, from Germany: Corrado Sweynheim and Arnoldo Pannartz. Click on the picture below to see some aspects of our business, associated with typography. Speaking of typography, it is fair to remember a number of boys that went through our Abbey in the years 1950-1970. In the 50s, in the wake of what happened in the Abbey San Giuliano di Genova, Finalpia Abbey welcomed boys with family problems, to help them finish the compulsory school and introduce to jobs at the printing shop. In twenty years we have seen several dozen boys. Their number was fixed to 4/5 elements, who took turns. Receiving accommodation, food and schooling. Every year, they sit examination in state schools. They repaid by helping out in the printing shop. When they left the Abbey, the boys were able to permanently integrated into work (and not only as printers). The experiment Artigianelli ran out in the 70s. There also were those who become fathers, they returned to greet and thank. Some of them have maintained contacts with the Abbey. It is true that today we no longer have a printing press, but at home there is a decent equipment for digital processing of standard prints for our monastic community. A special day deserves a mention, that of the Sick and Elderly, held at the end of May of each year and that is deeply felt (the participants usually exceed the hundred people). 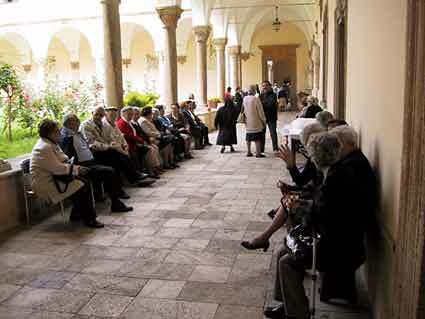 It is an opportunity for those who suffer from age and / or health of being together to pray (in the Sanctuary of Our Lady Pia) and a convivial moment (in the refectory of the monastery) and to review (in the cloisters and in the halls of 'Abbey) of familiar faces and meet new ones. Click on the picture below to see the Day of the Sick and Elderly of 2013.